Playmonopoly.us and Albertsons.com Monopoly Collect & Win game. 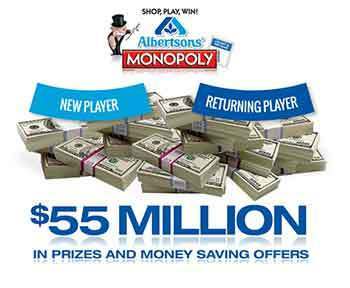 Play monopoly for money prizes (albertsons.playmonopoly.us) with over $20,000,000 in PRIZES and money-saving offers. Indeed, Shop, Play & WIN with Monopoly Game – Board Game. Get in the game – collect your tickets, enter codes, and WIN! The North American grocery company is sponsoring this incredible promotion where you have the chance to win fabulous cash prizes and more. You must be at least 18 years of age and a legal U. S. resident of Arizona, Arkansas, Colorado, Florida, Louisiana, New Mexico and Texas. This monopoly game promotion ends on June 10, 2014. You have instant win game and collect & win game. The buying and trading properties board game published by Parker Brothers have always been one of American favorite boardgame. We can see these days revive Monopoly-themed online game marketing promoted as sweepstakes and giveaways and sponsored by big company names. Where entrant have the chance to win big cash prizes. Don’t miss your chance and visit today one of this sites: playmonopoly.us or albertsonsmarket.com and follow the on-screen instructions to enter the Monopoly Game for money prizes. The Monopoly online game promotion ends on June 10, 2014. Good Luck! See official website for game rules and prize details. Open the game ticket by tearing off the perforated portions to reveal either a special discount offer; online/sweepstakes coupon code; Instant Grocery Gift Card, Product or two (2) Free Game Tickets Prize; along with four (4) game markers which can be used on the game board. Moisten the glue strip on the back of the game markers and place the game markers on the exact corresponding matching prize play area spaces on the game board. Do not affix game markers to the game board (with glue or tape) in a permanent manner. To play the Online/Sweepstakes Coupon code, see Rule #4 for details on using the code for both the Online Game and to enter the Sweepstakes.” Good Luck! I love to shop at Albertsons! I have never won a sweepstakes or any prizes but I enjoy playing the Monopoly games. Here’s to winning! Thanks Albertsons!